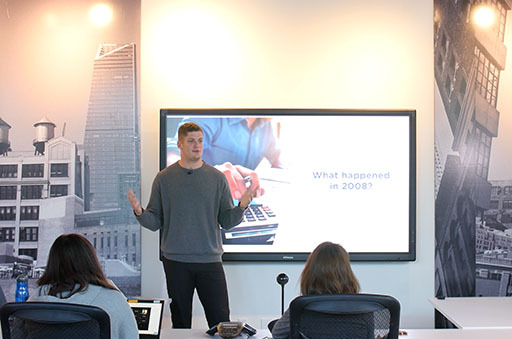 EL SEGUNDO, Calif. March 22, 2019 – Carl Nassib, a Tampa Bay Buccaneers defensive end and outspoken Financial Wellness advocate, just wrapped his NFL Players Association Externship experience with Financial Finesse – the inventors of Financial Wellness and the firm behind the NFLPA’s award-winning financial coaching program. There is increasing evidence that players like Nassib are becoming the rule, not the exception. As it stands, the average score of NFL players who took Financial Finesse’s patent-pending Financial Wellness Assessment (5.27) is higher than the national average (5.0). The Financial Wellness Assessment gauges financial habits and behaviors that predict future financial success— living below your means, saving sufficiently for the future, controlling debt, investing wisely and ensuring your wealth is protected. Even more impressive, 48% of players that completed a separate savings survey indicated they are saving 20% or more of their earnings — well above the national average savings rate, which typically hovers around 5%. Financial Finesse is the largest independent provider of unbiased workplace financial wellness programs in the country, delivering holistic financial coaching and guidance that helps employees improve their financial wellness. The firm's programs cover every area of financial planning and cost employees nothing out of pocket since they are fully paid for by their employers. Financial Finesse's programs are proven to change lives, provided through a variety of channels such as mobile financial coaching, live events, interactive webcasts, one-on-one financial counseling sessions and a financial helpline staffed by Certified Financial Planner™ professionals who do not sell any financial products or manage assets. www.financialfinesse.com.